The opulent kitchen is a gourmand's dream! State-of-the-art appliances include a six-burner Jenn-Air convection range. You'll love the marble counters and custom backsplash! The sunny and well-equipped laundry center features a farm sink and lots of storage space! Entertaining is a breeze on the massive flagstone terrace! A built-in grill and fridge help get the party started! And then there's the VIEW!!! The property also boasts a private pond! This breathtakingly beautiful home will completely captivate and entrance you! You'll never want to leave! 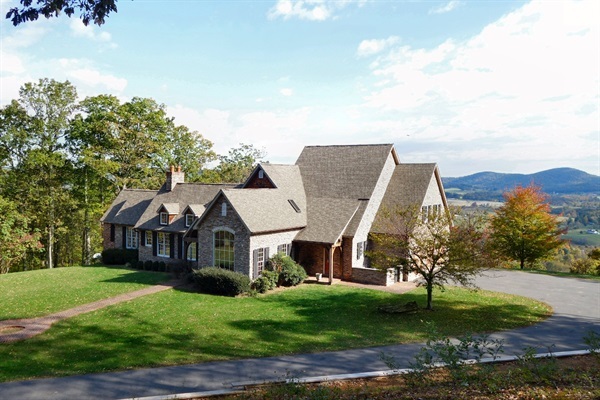 Resting on 50 acres at the top of a mountain in Markham, Virginia, this estate is a beautiful place to bring your family and relax for a weekend or week. See a sunset that lights up the valley below for miles into the distance. This custom built house has the finest materials, appliances and floor coverings in the area.